Desertification or land degradation in dry lands is a global problem with expanding trend. It is the consequence of over grazing, over cutting of woody vegetation and poor cultivation practices. 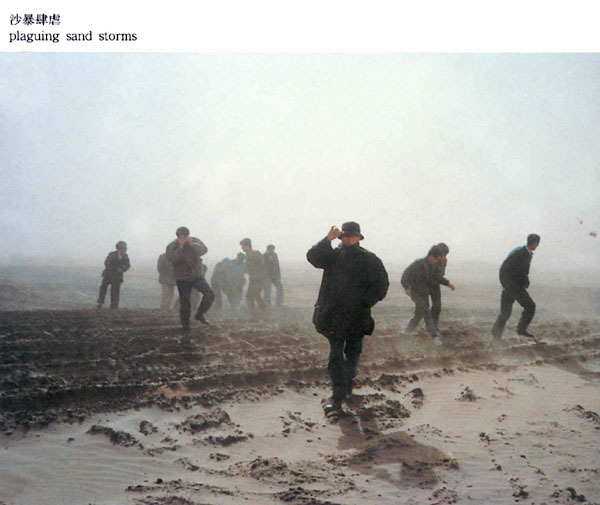 Desertification and the reduction or destruction of arable land has had a major effect in China, where a big majority of the population remains rural. The most seriously affected regions are located in the 13 provinces and autonomous regions in the arid, semi-arid and dry sub-humid areas across the northern China. 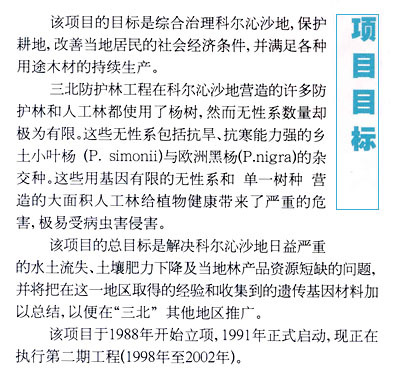 Many national minorities, including the Mongolians, Uygurs, and Tibetans, inhabit the area where approximately 60% of the poor counties across China are situated. 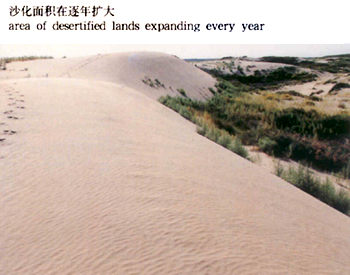 The Government of China estimates that the land area affected by desertification in China is approximately three million km2, taking one-third of China's total land area. Desertification is reported to be expanding at an annual rate of 2640 km2 leading to a loss of 5 billion tons of topsoil. The total area affected by aeolian erosion is estimated to be over 1.6 million km2. 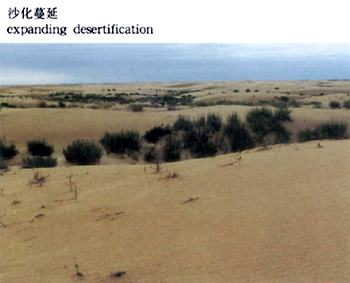 In addition to the reduction of arable land, there are some other critical problems also associated with desertification. Caused by the fact that water resources are diminishing, many permanent watercourses have become seasonal and underground water tables are dropping in many areas. 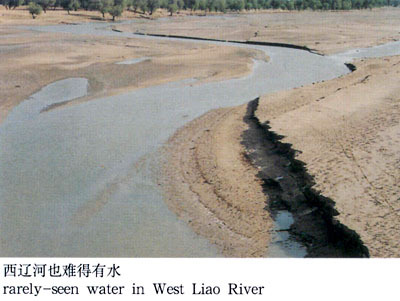 The changing water regime contributes directly to the degradation and loss of indigenous vegetation. Inefficient use of water resources for agriculture practices in dry zone increases the risk of soil salinisation. It has been reported that there are some 99 million ha of saline land throughout the whole country as a direct result of poor or inadequate irrigation practices. 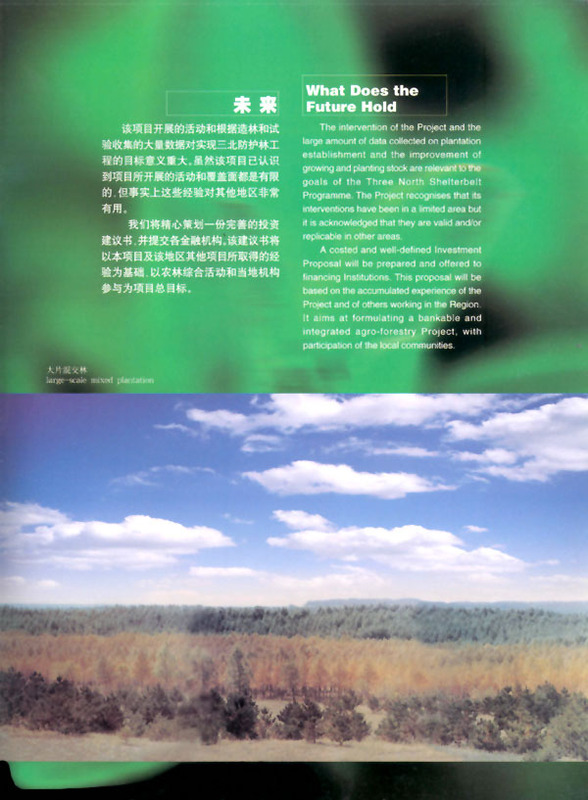 To tackle the immense problem of environmental degradation and the ever increasing loss of natural resources, since 1978, the Government of China has started the implementation of the Three-North Shelterbelt Programme, namely the “the Great Green Wall”, which is composed of the network of shelterbelts and tree plantations across the entire region in the north of China. One of the main objectives of the Three-North Shelterbelt Programme is to protect agricultural and pastoral land, as well as human settlements, from wind and water erosion. 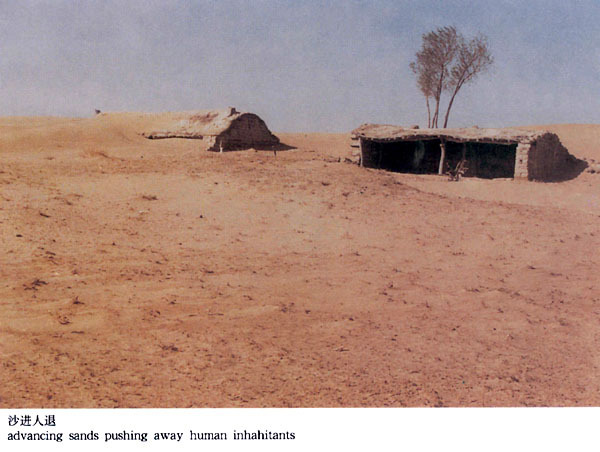 The means to achieve the above include establishment of shelterbelts, introducing improved land management and desert and sand dune stabilisation and reclamation. The Three-North Shelterbelt Programme in the north of China covers an area of 4.06 million km2, up to 42% of the country's total land area. There are 170 million people living in the region and living. 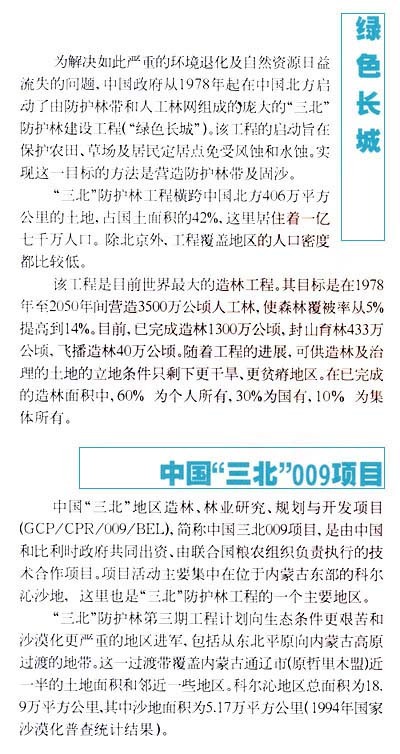 With the exception of Beijing, the population density of the region is fairly low comparing with the whole country. The Three-North Shelterbelt Programme is the largest afforestation programme in the world. It aims to establish 35 million ha of shelterbelt forests between 1978 and 2050. 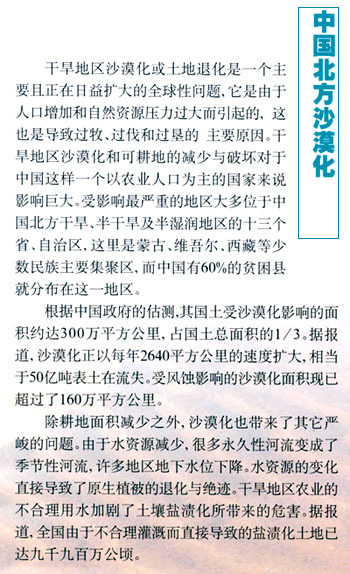 By then the forest cover in the Three-North Region of China will increase from 5 to 14%. So far, over 13 million ha of plantations have been established; 4.33 million ha of mountainous and highly degradable land were closed and protected from grazing and fire and 0.4 million ha of forests were established by aerial seeding. As the Three-North Shelterbelt Programme progresses, only the land located in more arid and infertile sites remains available for afforestation and rehabilitation. Among the established plantations, 60% are owned by individuals, 30% by the state and 10% by the collectives. 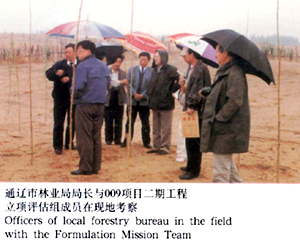 The Project was created as a result of an urgent need to protect cultivated land against the severe degradation caused by wind and water erosion in the Korqin Sandy Lands, to improve the socio-economic well being of the inhabitants of the region and for the need to sustainable produce wood for all sorts of uses. 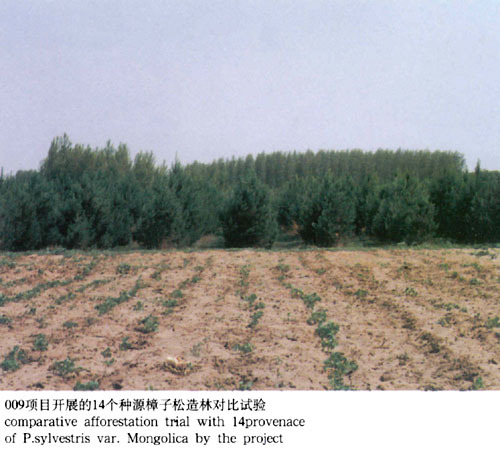 Many plantations and shelterbelts of the Korqin Sandy Lands have been established under the Three-North Shelterbelt Programme using poplars and relying on only a small number of clones. 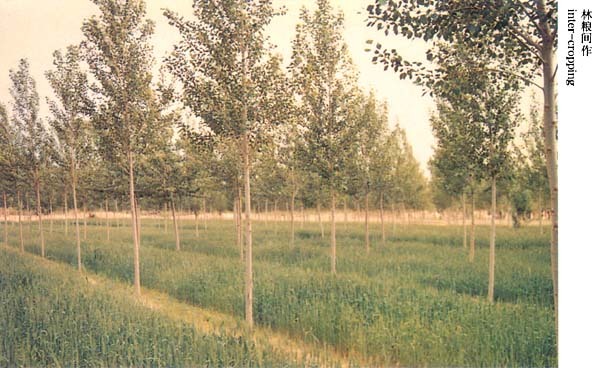 Clones include hybrids of the native drought and frost resistant species (Populus simonii) with the European black poplar Populus nigra. The limited genetic diversity in the plantations and monoculture over large areas has generated important phyto-sanitary hazards, including a worrying susceptibility of the plantations to harmful insect pests and diseases. 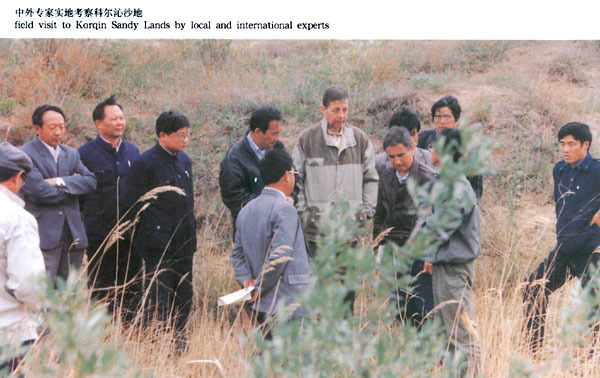 The overall goal of the Project is to address the problems of ever increasing soil erosion, decreasing soil fertility, and the lack of wood products needed by the local inhabitants of the Korqin Sandy Lands, and to consolidate the experience and genetic material acquired in order to test it and later replicate or expand it to other areas of the Three-North Shelterbelt Programme. 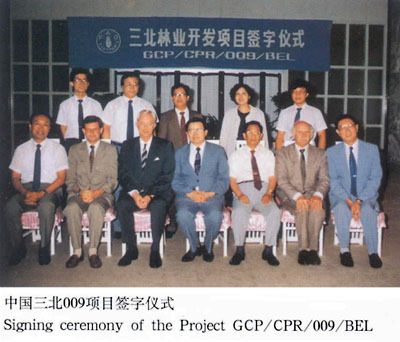 Negotiations about a Project of this scope to assist the Government were first initiated in 1988 and the Government of Belgium agreed to fund the Project that became operational in 1991. The Project is now in its second phase, and will cover the period 1998 to 2002. The project area is located in a semi-desertic environment experiencing a continental climate. The Region covers an area of 42, 000 km2 and receives an annual rainfall of 300 to 500 mm, mostly in summer. The area is characterised by sandy soils, with a critically low content of organic material and a shallow groundwater table. Winters are long, and temperatures drop to minus 15°,, C in January, while the absolute minimum temperature can reach minus 33°,, C. There are about 140 to 170 frost-free days. Soils freeze to a depth of 160 cm, depending on local conditions, and stay frozen until spring when temperature goes higher. Wind and high temperature in summer characterized by a harsh continental climate, raise potential evapotranspiration to 2–3 times higher than that the amount of rainfall. Where drainage is poor, marshes result; these sites often become saline and alkaline and are less productive. 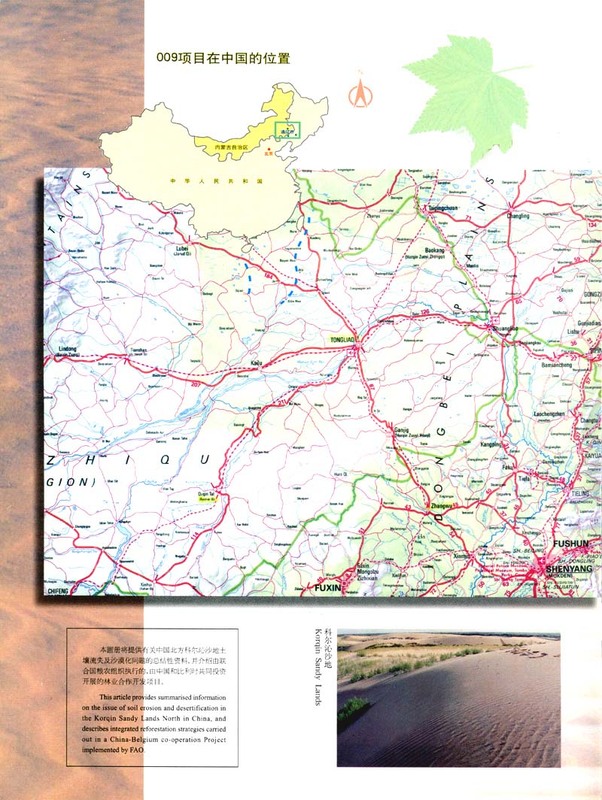 Saline/alkaline areas can be found throughout the Korqin Sandy Lands, but they are mostly located in its northeastern part, where Tongyu Branch of the Project is located. Animal husbandry is the traditional economic mainstay of the population who originally was pure Mongolian. 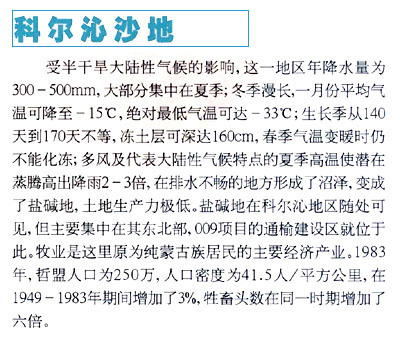 The total population of the Zhelimu League was 2.5 million in 1983, with a density of 41, 5 person per km2, increasing at an annual rate of over 3% during the period 1949–83. The domestic animal population has increased more than six-fold during the same period. 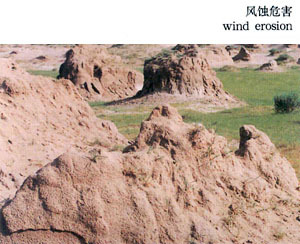 In early times, Korqin was not a semi-desert, but grassland with dispersed trees (savannah-type woodland), in transition between dense forest and the steppe zone. The rolling sand-sheet was deposited during the last glacial period (W®πrm, 12000 years BP). 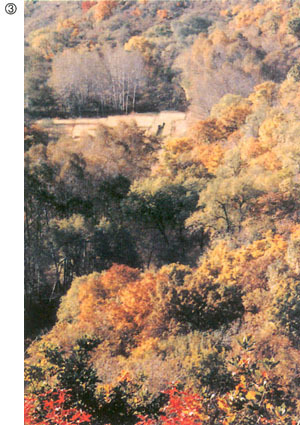 During 10,000 years of vegetation growth, thick dark topsoil developed. 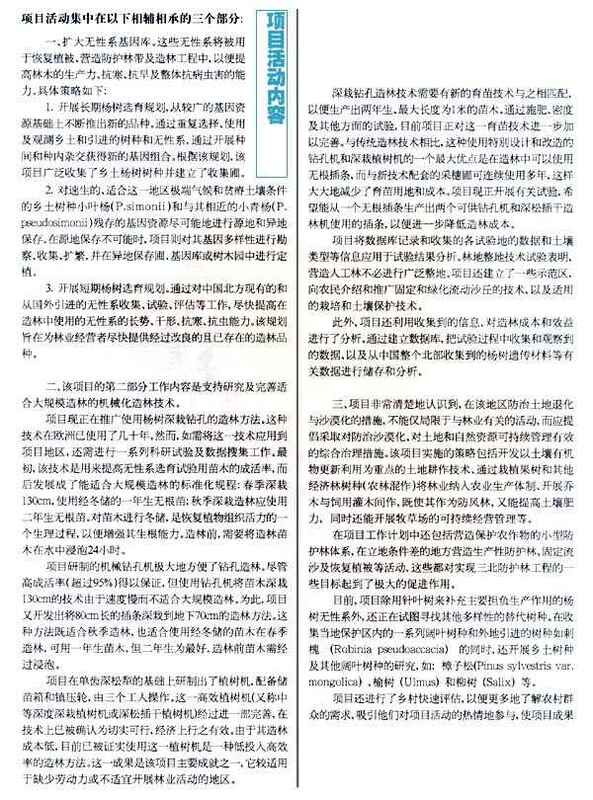 Since historical times, the region has gone through several cycles of man-induced desertification and subsequent recovery, when human pressure lessened. By the middle of the 10th century, Korqin had developed into a prosperous agricultural and grazing area. 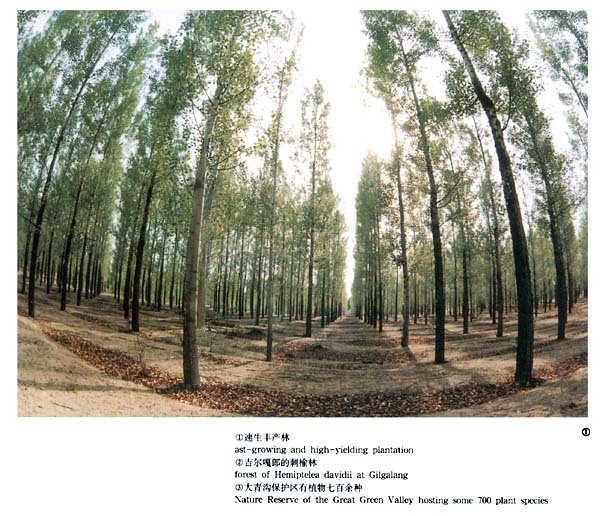 At the time of the Jin Dynasty in the 12th century, the forest had reportedly disappeared and the land was covered with sand. 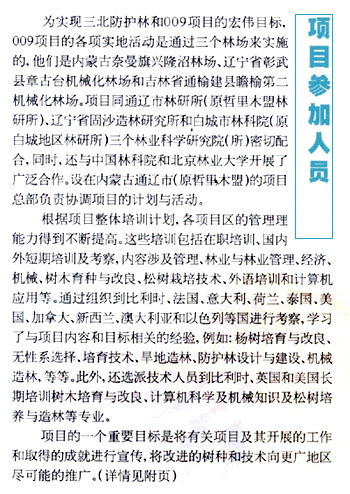 By the beginning of the 17th century, Korqin thrived again, but after the middle of the 19th century, with the Qing Dynasty pursuing a policy of reclaiming °∞ wastelands°±, forests and grasslands were once again destroyed and bare soil surfaces gave way to wind erosion. Fertile dark topsoil vanished and extensive dune fields gradually build up. The latest desertification period would thus have occured during the last one hundred years. Overgrazing (by cattle, goats, sheep, camels, horses), clearing of land for agriculture and over-cutting of trees and shrubs in this vulnerable ecosystem have resulted in an increasingly severe land degradation and desertification. Little remains of what was once the natural vegetation in the region. 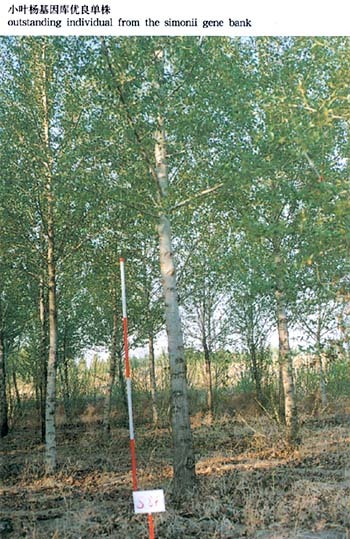 Some relics of poplars (Populus simonii), willows (Salix matsudana, S. gordejevii and other species), wild peach trees (Prunus armeniaca) and elm trees (Ulmus pumila and other species) can still be found. 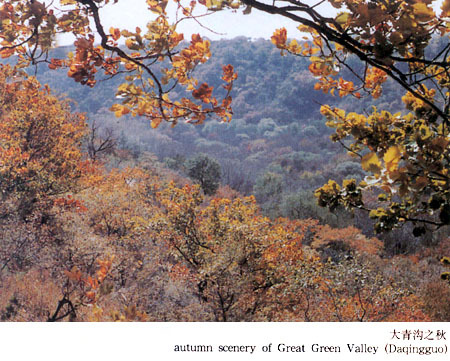 A nature reserve named Daqinggou (the ‘Great Green Valley’) in southern Korqin has survived until now, with a rich mixture of tree and shrub species (Quercus mongolica, Fraxinus mandchurica, Tilia amuriensis, Acer truncatum, Juglans mandchurica, Crataegus pinnatifida) and many other woody plants and grasses. 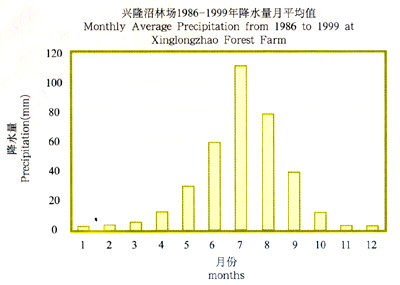 Tree growth in Korqin is largely dependent on the presence of a high groundwater table, fed by percolation and inflow from the western and southern mountainous areas. The long-term trend of a decreasing depth of the groundwater table is due to an increasing demand for water to irrigate crops and for human and industrial needs. There is a sound argument in favour of enhancing the soil's capacity for the percolation of rainwater and diminishing run-off. 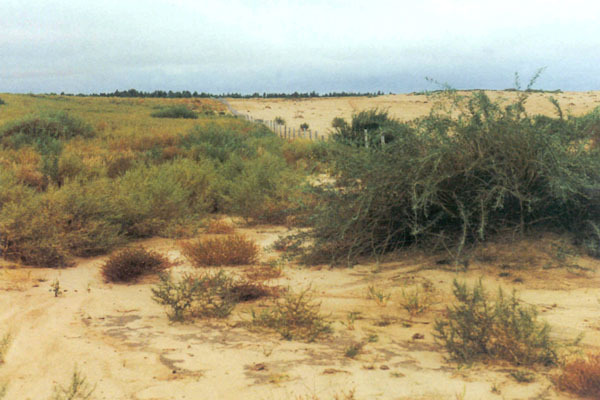 Wind erosion is obvious and most pronounced in spring, when sandstorms are common and the vegetation is still absent or dormant after severe winter temperatures. Soil fertility, already critically low, has shown a sharp decline as all organic residues from crops are removed for fuel and fodder during wintertime. 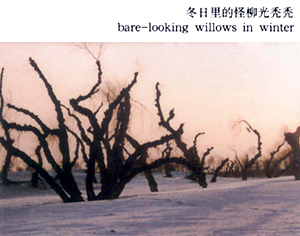 Willow and poplar stands are pollarded in autumn, before leaf fall, for the same purpose. The continuous removal of potential nutrients to the soil is not balanced by the relatively small amounts of manure and inorganic fertiliser applied to crops. This has serious implications for future productivity and sustainability. Unfortunately, figures on long-term yield trends are not available. 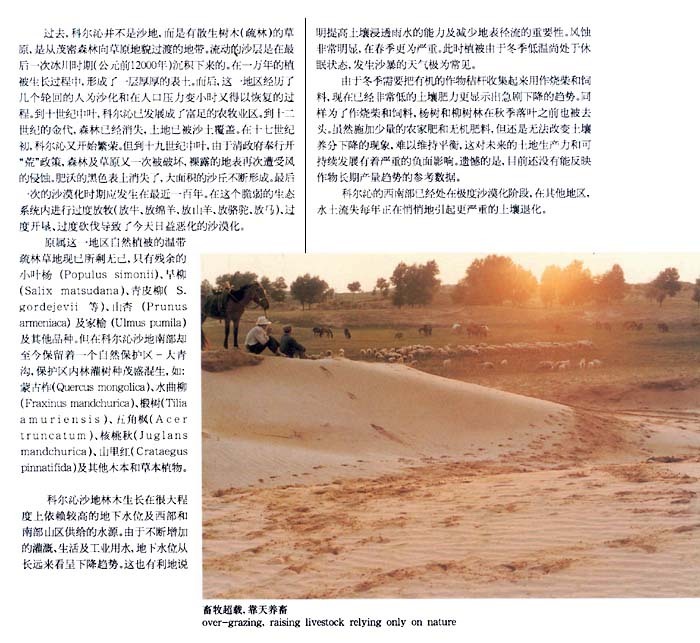 The South-western Korqin has reached a stage of severe desertification, while in the other areas, water and wind erosion continue unabated causing more serious land-degradation year after year. 1. 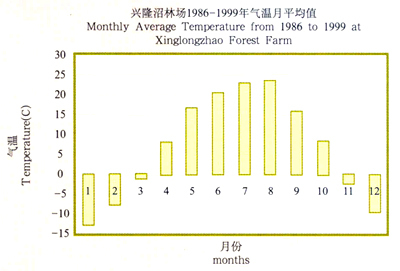 Widening of the genetic base of clones used in reforestation, shelterbelt and afforestation programmes in order to increase productivity, resistance to frost and draught, and overall susceptibility to pests and diseases. Three strategies are being implemented to achieve this goal. 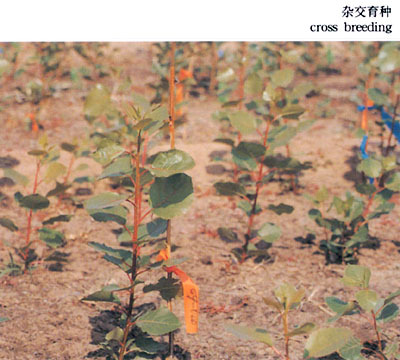 a) The development of a long-term poplar breeding and selection programme, to continuously produce new material from a wide genetic resource base. Through recurrent selection, using and surveying the performance of indigenous and introduced species and clones, the programme relies on intra-specific and inter-specific hybridisationoØs and crosses to obtain new genetic combinations. 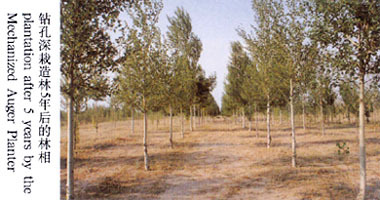 The plan makes provision of a wide base collection of native poplars. b) Ex situ and in situ conservation of the remaining pockets of genetic resources of P. simonii and related P. pseudosimonii, the only fast-growing indigenous species adapted to the extreme climatic conditions and to the poor soils of the region. Whenever possible, this unique genetic material is conserved in situ (on site). 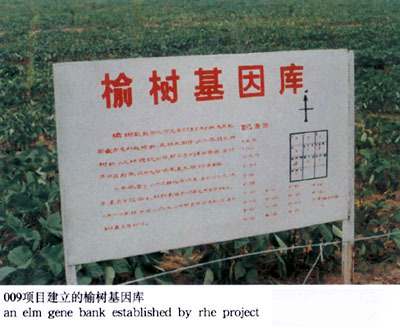 When this option is not possible, samples of genetic diversity are explored, collected, propagated and stored in ex situ collections, gene banks and arboreta. 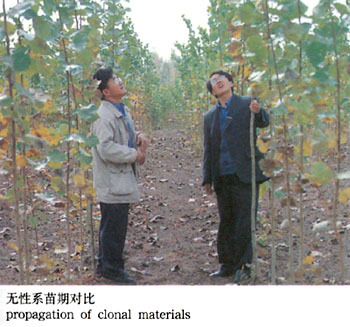 c) The development of a short-term poplar selection program, to rapidly improve the vigour, form, and resistance to frost and pests of the clones used for afforestation, through collection, testing and evaluation of poplar clones already available in Northern China and abroad. The programme is intended to rapidly provide forest managers with improved but already existing materials. 2. 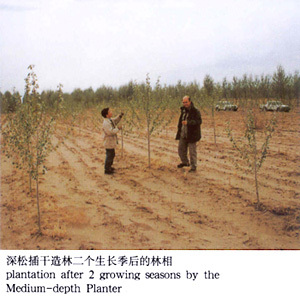 The second approach is to develop and fine-tune mechanised afforestation techniques, suitable for large-scale tree planting and plantation establishment. 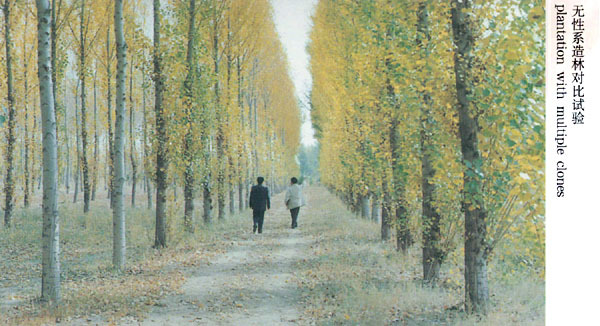 The Project has been advocating the use of the deep-planting techniques for poplars, as already done for decades in Europe. It was, however, necessary to adapt this technique to the local environment, through a series of scientifically conducted experiments and data collection. 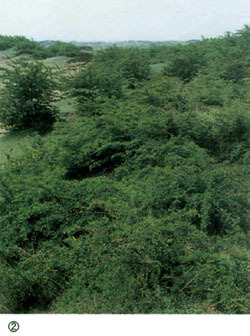 The technique was first tried out to increase survival for the clonal selection programme; later standard procedures for large scale reforestation were developed: planting at a depth of 1. 3m, using 1-year old cuttings without roots buried over winter for spring planting, or 2-year old cuttings for autumn planting. Burying the cuttings over winter starts a physiological process for rejuvenating the plant tissues so that rooting capacity is increased. Cuttings should be soaked for 24 hours in water. Specially designed mechanical augers have been produced by the Project for drilling holes to facilitate the planting technique. 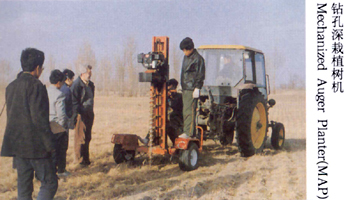 Although assuring excellent survival rates (over 95%), the technique of using a mechanical auger to dig holes to a depth of 1.3m is judged to be too slow for large-scale afforestation. 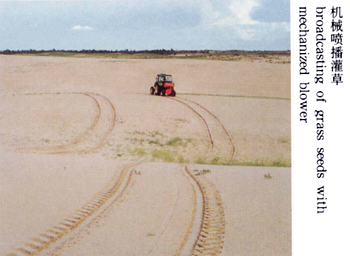 Therefore, another method has been tried using 80cm long cutting pushed as deep as 70 cm into the sand. This can be done in autumn or eventually in spring if the cuttings have been buried over winter. One or two-year-old cuttings which have been soaked in water before planting should be used. The Project developed a special planting machine based on a single shank soil ripper, providing attachments for carrying planting stock, three operators and packing wheels. 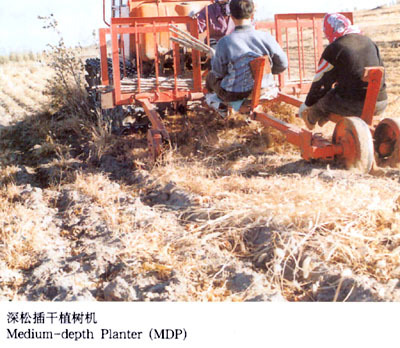 The development of this fast planting machine (called Medium Depth Planter or MDP) has been fine-tuned to ensure that it is technically viable to operate and cost effective. Presently, the Medium Depth Planter has proven to be a cost effective way for tree planting and it is considered a major achievement of the Project in the area where human labour itself is scarce or not available for forestry activities. 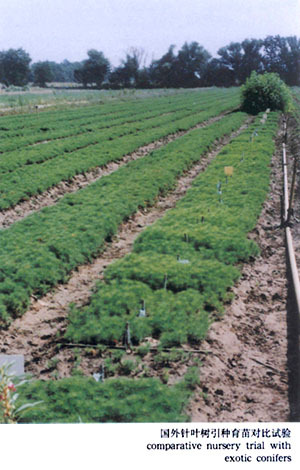 Utilising this new planting technique involves a new nursery technique, to produce planting stock of mostly 2-year-old cuttings with a maximum length of 1 m. This nursery production technique is now being improved with trials on fertilisation, spacing density and other aspects. The big advantage of using specially designed and adapted techniques (augers and Medium Depth Planters) as compared to the traditional planting, is that it allows using un-rooted cuttings, thereby diminishing drastically the area and costs of the nurseries given that stoolbeds can be used for many years. The Project is now undertaking trials to further reduce costs, using each un-rooted sapling in nursery to produce two viable cuttings from each shoot for planting with the MDP technique. 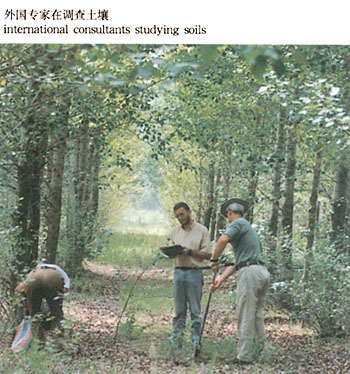 Meteorological data and information on soil conditions of the experimental sites is being registered and kept in databases for analysis of the results of the trials. 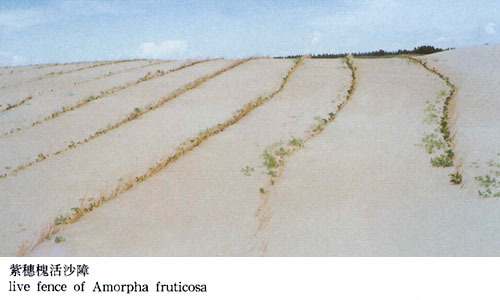 Trials on preparation techniques of plantation sites have shown that for plantation establishment it is not necessary to do extensive site preparation or tending, and it is in fact better not to do so, in order not to cause soil wind erosion. 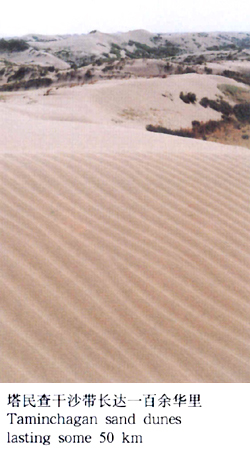 Demonstration areas have been established for the fixation and greening of shifting sand dunes, and for appropriate cultivation and soil conservation techniques for the local farmers. Data on costs, effectiveness and efficiency of the afforestation techniques being tested and developed is stored and analysed carefully. 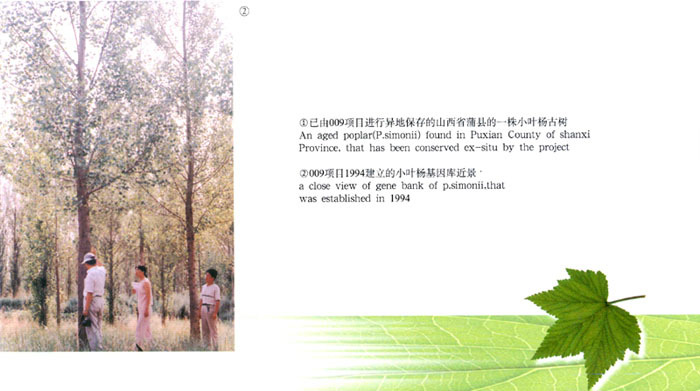 At the same time databases are being kept to store the information recollected on trial measurements and observations, and on the poplar genetic materials being recollected from all over Northern China. 3. 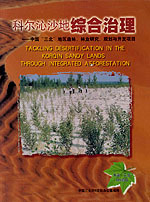 The Project is fully aware that the battle against land degradation and desertification in this region should not be limited to focusing only on forestry related activities, but it should also promote an integrated approach and a well defined strategy regarding the issues leading to desertification and the need for an agreed and sustainable land use and management of natural resources. 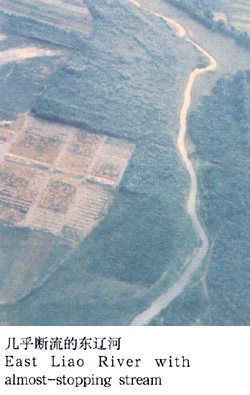 The Project strategy includes the promotion of more appropriate land cultivation techniques, emphasising the recycling of organic material in the soil; the incorporation of trees into the productive system of farms through the use of fruit and other cash-crop trees (agro-forestry); the establishment of windbreaks with tree and shrub fodder species and with species capable of improving soil fertility; and the sustainable management of grazing lands and pastures. In addition, several themes aiming to contribute to the objectives of the Three-North Shelterbelt Programme have been incorporated in the ProjectoØs work plans. 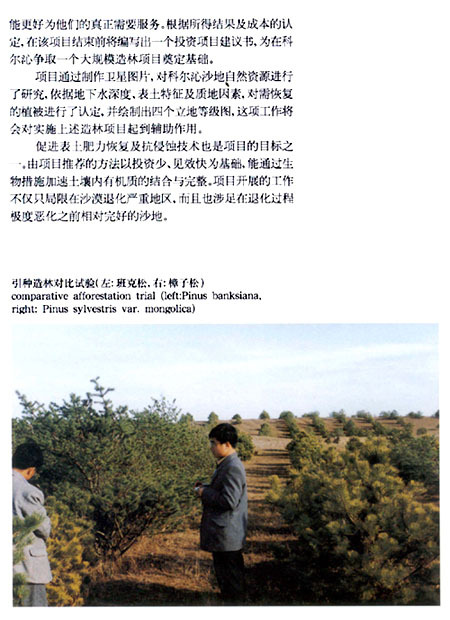 They include the development of small-size shelterbelts for the protection of individual farmersoØ crops, the establishment of pilot productive shelterbelts on poor sites and the fixation and re-vegetation of shifting sand dunes. The Project is also trying to identify suitable forest species, which could complement the productive role of poplars, offering more biological diversity. Trials are being undertaken with the native Scots Pine Pinus sylvestris var. 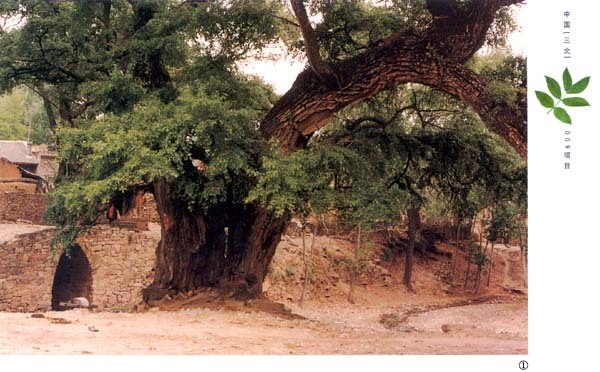 mongolica, the introduced pine species and provenances and other indigenous species, such as elms (Ulmus) and willows (Salix), as well as a series of other broadleaf species recollected locally in protected areas and those introduced from other Regions such as Robinia spp. Rapid rural appraisals have been implemented to learn more about the needs and requirements of the rural population in an attempt to promote and secure their involvement and participation in project activities in order to better target project outputs so as to meet their needs. 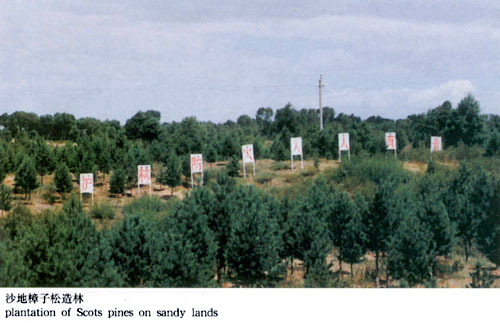 Based on the results obtained and the determination of the costs involved, an investment proposal will be formulated at the end of the Project which will form the basis of a major afforestation input in the Korqin Sandy Lands. 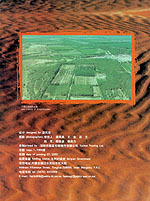 A study of the natural resources of the Korqin Sandy Lands, carried out by the Project with satellite imagery, led to the definition and mapping of four site classes for potential revegetation based on the depth of the groundwater table, top soil characteristics and topsoil texture. This site classification map is proving to be a powerful tool not only for the planning of afforestation and revegetation activities but for all involved in land-use and rural development. Enhancement of topsoil fertility restoration and implementation of biological anti-erosion techniques is also part of the Project objectives. The proposed methodologies are based on the most cost-effective options and aim to enhance biological processes to speed up the incorporation and integration of organic matter in the soil. The Project activities are not only limited to the most degraded areas, but also include preventing erosion on the still relatively intact sandy lands before the degradation process there becomes too severe. To achieve the ambitious goals of the Three-North Shelterbelt Programme and of the Project GCP/CPR/009/BEL, the Project is operating through three Forest Bureaux, which supervise the work of three Forest Farms where the Project fieldwork is carried out. 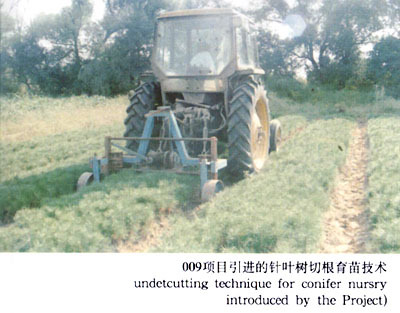 These farms include the Xinglongzhao Forest Farm in the Naiman Banner, Inner Mongolia; the Zhangwu Mechanised Forest Farm in Zhangutai, Zhangwu Country, Liaoning Province; and the Number Two Mechanised Forest Farm in Zhanyu, Tongyu Country, Jilin Province. 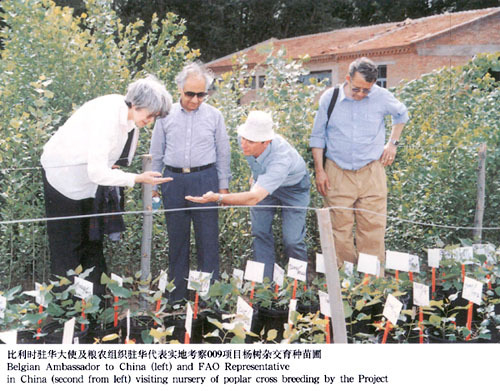 The Project also collaborates closely with three Forest Research Institutes (Zhelimu League Forest Research Institute; Liaoning Sand Fixation Research Institute and Baicheng Forest Academy). 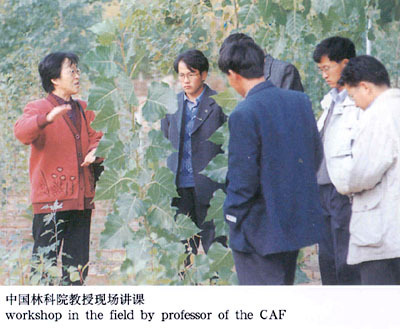 Intensive co-operation has been established with the Chinese Academy of Forestry in Beijing and the Beijing Forestry University. The ProjectoØs HQ, which co-ordinates project planning and activities, is based at Tongliao City, Zhelimu League, Inner Mongolia. The institutional capacities of various agencies and bureaux are being strengthened through a comprehensive training programme, including in-service training, local and international study tours and fellowships, in areas related to Project management, forestry and forest management, economics, mechanisation, tree breeding and improvement, pine nursery techniques, English language training and computer use. The international study tours were organised to Belgium, France, Italy, the Netherlands, Thailand, the USA, Canada, New Zealand, Australia and Israel. International fellowships have been organised in Belgium, England and the USA. An important objective of the Project is the publication and dissemination of information collected on the numerous trials established by the Project, its work and achievements, and possible applications of improved materials and techniques to a wider area. The intervention of the Project and the large amount of data collected on plantation establishment and the improvement of growing and planting stock are relevant to the goals of the Three North Shelterbelt Programme. The Project recognises that its interventions have been in a limited area but it is acknowledged that they are valid and/or replicable in other areas. A costed and well-defined Investment Proposal will be prepared and offered to financing Institutions. This proposal will be based on the accumulated experience of the Project and of others working in the Region. It aims at formulating a bankable and integrated agro-forestry Project, with participation of the local communities.